I take commando shopping very seriously- the ability to shop in a seriously restricted period of time has been something I have honed over years of kids with limited attention spans and a husband who hates crowds. Heading away to Warrnambool was a chance to see some new shops. I had scoped a couple of op shops online before we arrived, and I knew there were a few vintage shops in Warrnambool as well to take a quick browse in. With only 3 days and an already full itinerary it would be hard to squeeze in quality browsing time. With a fully packed car with bikes and luggage it would also be a challenge to get anything home. Items bought would have to be small and compact. 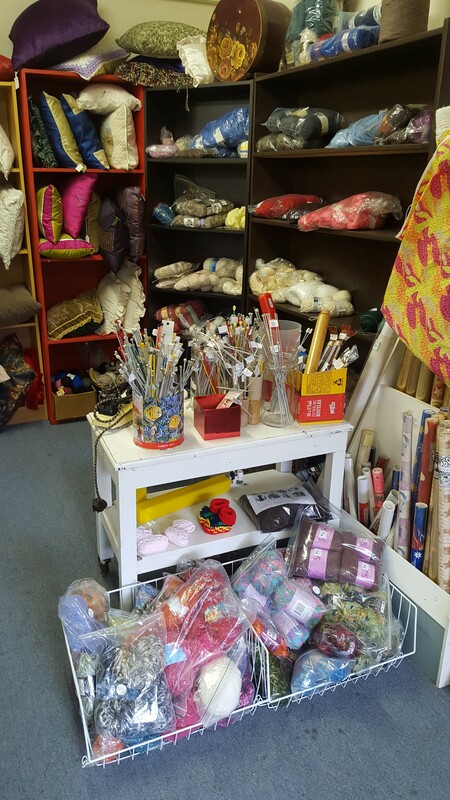 The first shop was Colac Vinnies– the best thing about this place is its location, across the road from a park with a playground. It’s a perfect chance to drop in for 5-10 minutes while the kids are playing or heading to the toilets. 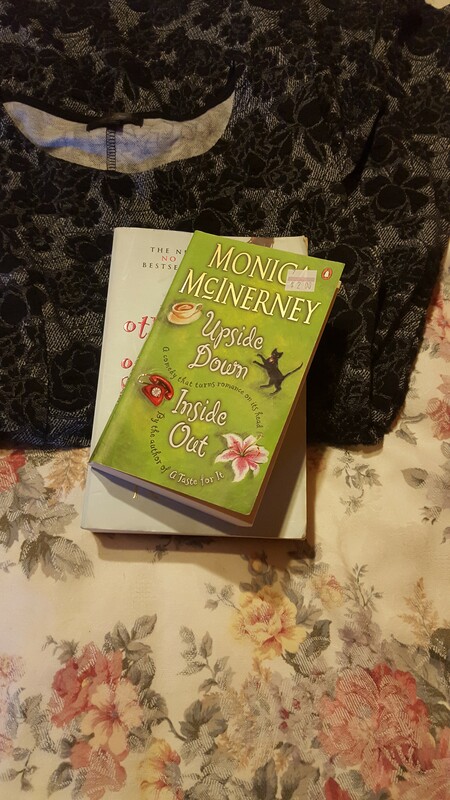 They had books half price and I scored a couple of titles to keep me occupied in the evenings. Total cost $2.50 for two books. I also managed to slip out for 45 minutes in the afternoon one day while the kids were winding down after a big day out. I made a quick detour to the atm then visited 3 op shops and a vintage shop in quick succession. Three of the shops were all in the same street which made it easy to visit. 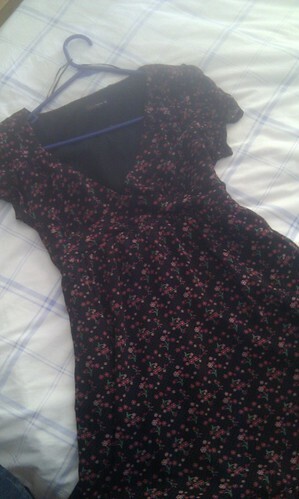 I managed to score the dress above for $5.00 at the Salvos. The Vinnies and RSPCA did not yield anything, and there were some lovely coats to be had at the Long Gone Antiques and Collectibles, but I wasn’t in need of any. 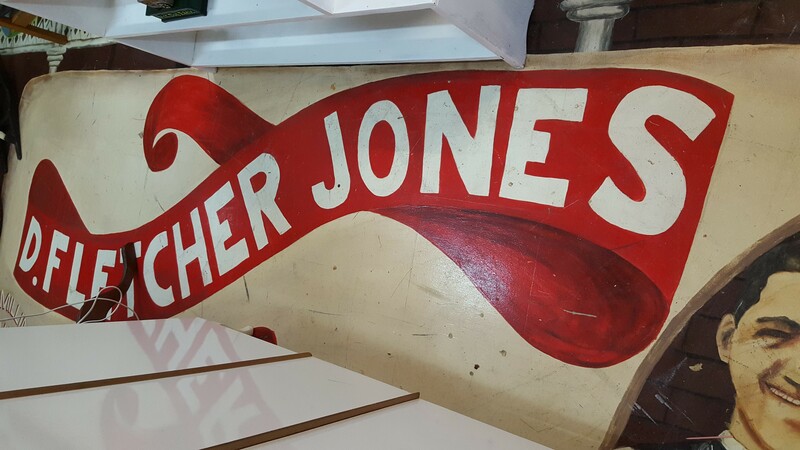 We spent the final morning at the Fletcher Jones Market. 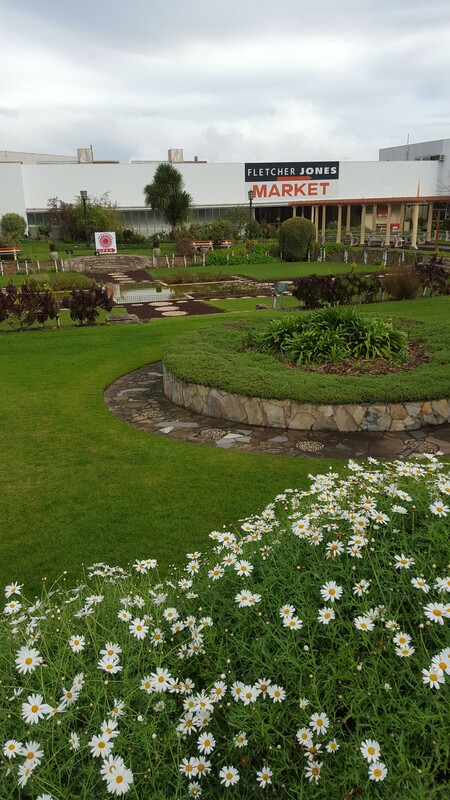 The market is similar to the Mill Markets in Daylesford, Geelong and Ballarat with heaps of stalls of antiques, collectibles and bric a brac. It’s situated on the site of the old Fletcher Jones factory which closed in The market itself is located within the part where womenswear was manufactured, and you can still see vestiges of the factory. The upper level looks like offices and allows for little stalls- I found one room with linen, fabric and yarn. I stepped away from the yarn as quietly and as quickly as possible- yarn has an innate tendency to want to come home with me and I have enough of a stash without bringing more home :). I got myself a little cup and saucer and platter and MrBG managed to score a nice tweed Christian Dior jacket. By this stage the kids were clamouring to head off and hit the road. There’s an opp shop in my street! 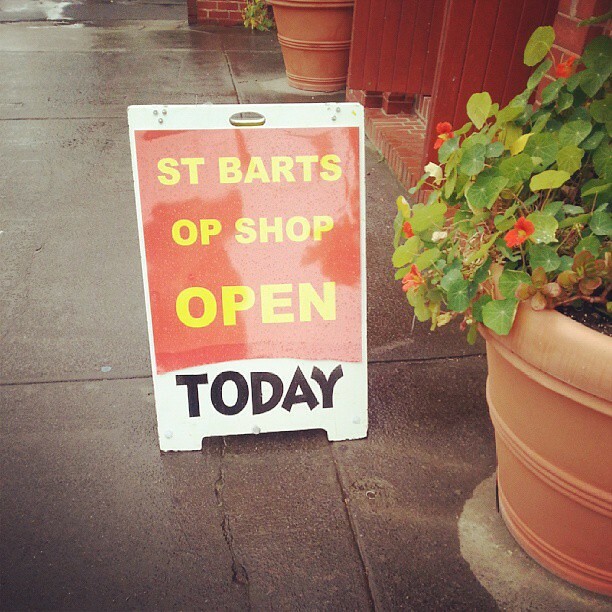 St. Peter’s Anglican church in Sturt Street has an op shop in their hall on a Friday from 10am to 2.30-ish. It’s a minute’s walk from my house, and with Master BG eager to escape from the house for a short while (he’s got a cold and was home from school), it was too good of an opportunity to miss. I have an opp shop in my street! It’s mainly clothes, with a little bit of bric-a brac, and they have a cupboard of manchester and napery. What I love about it is that when you walk into the foyer, the volunteers are always milling about, chatting and often having a cuppa. When I was paying for my items, they were discussing the latest news of the Ballarat diocese allowing female deacons to be ordained as priests. One lady was bemoaning the fact she would be away during the ordinations for two female deacons already working in Stawell and Warrnambool. ‘You know, my husband would be turning in his grave at the moment’ she declared. Another lady nodded.’So would mine,’ she said, with a grin. I somehow get the feeling they were revelling in the news. I was driving down Burnley Street, Richmond a while back and noticed a couple of shops I wanted to visit. It was a bit hard to check them out at the time as Mr BG and the kids were in the car with me, we were all tired and just wanted to get home, so I made a little promise to myself to visit one day and check them out. Yesterday was the day! I had a flex day, and hopped down to Melbourne, to catch up with friends for coffee and to indulge myself. The first shop was Minette’s Vintage, which was a darling little shop, full of beautiful vintage clothes, quirky cards and essential vintagey-looking things like wooden pegs and scrubbing brushes. The second was The Industrial Revolution, which was furniture, and soft furnishings with a industrial/metal vibe. Both shops were very cool and great in which to poke around and peruse. I didn’t buy anything in either, but it wasn’t a wasted trip. It was lovely to be by myself and do something I wanted to do, even if it was in the rain, and I didn’t have an umbrella :). 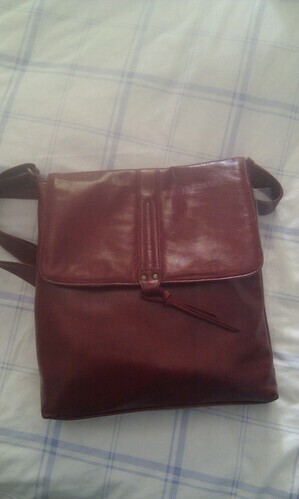 I did however get lucky and spied an opshop which was open! It was St Bartholomew’s Anglican Church Op Shop in Burnley Street and I did not leave empty handed. I scored a white scarf ($1), a pair of peep toes shoes ($5), a jacket ($10) and a top ($3). It topped off what was a lovely day off. And no housework was done either! For the past few months, my pastime of heading off to the opshop for a bit of window browsing and retail therapy had pretty much stopped. I think it had more to do with the fact I had been living out of a suitcase with a limited wardrobe for so long, that I was somewhat shocked to return to a full wardrobe of clothes. I still continued to visit, but I was dropping off clothes rather than buying. Doing a cull of my wardrobe (and the little BGs) was cathartic :). I also instituted a strict rule of one in, one out- if I were to buy any new clothes, I would have to remove the same number of items from my wardrobe. I try to be mindful of my shopping, even with opshop purchases and won’t really buy, just because it’s a bargain! I finally broke my opshop drought on Friday. I was browsing through the local Salvos store near my work, and came across this lovely skirt. 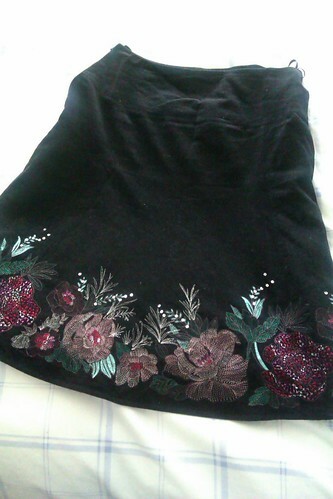 It’s a Laura Ashley, black velvet, with gorgeous embroidered flowers and beading along the hem. It was $7.99 and another dollar for the huge tote bag I bought. 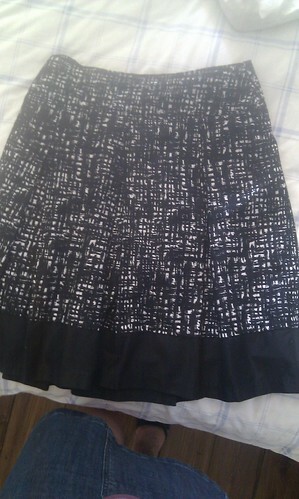 I wore my new skirt out that night to a gig where Mr BG was playing. So now I’m off to my bedroom to weed out a skirt :). One of the joys of going for a fossick in an opshop is that you never know what you will find.It is so hard to go past one, even if it is for a browse, and with most of the stock reasonably priced, you can justify handing over a couple of dollars for something which catches your eye. It is even better when you shop out of town, or at a shop you haven’t visited. The stock is different, it appears fresh and there is always that feeling you are walking into a cave of treasures. 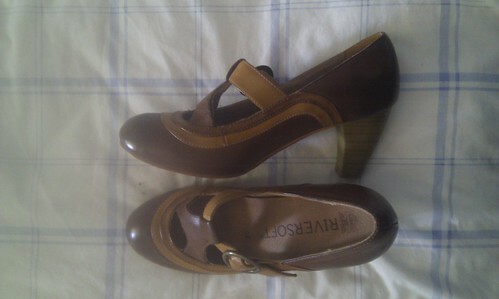 A month ago I had been in Geelong at the Vines Road Vinnies where my mum volunteers and found a pair of gorgeous shoes for $8.50. 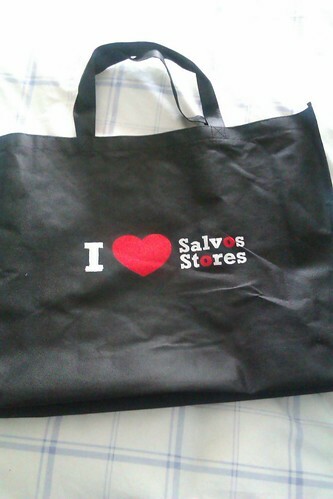 I had to use my card for EFTPOS and to make it up to the minimum $10, I picked up a bag for $5.50. Another visit to the same store a couple of weeks ago dropping off the little BGs for a sleepover with Nana and Papa* saw me walk out with a dress for $8.00, which I promptly wore out for my night at the movies with Mr BG. Coming home to Ballarat, I stopped in at a Salvation Army Thrift store I had never visited before in Ballarat and found a skirt for $2.50 and a belt for $1.00. *Yes, two nights of coupledom, whereupon we went out to the movies, I drank a martini, went out for breakfast, washed the car inside and out and scrapbooked. 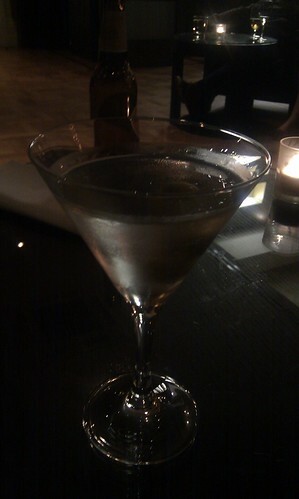 It was lovely. It’s been a while since I was op-shopping, but strolling through the Royal Arcade on my lunch break, I could not resist and went downstairs for a little peek. A little wrap top from H&M which will go very nice over a little black dress and a pair of patent Mary Janes, for the sum of $15. They were a bit on the pricey side, but it is the CBD and the rent would not be cheap, even if it is in a basement! The month of October has so many things happening in it, it is hard to keep up! What this month has done so far is it has made me stop and think about not only what I buy, but why I buy. The aim of the month was to attain conscientious consumption, to think about where our stuff comes from and our alternatives, and in this aspect I’m getting there. For a lot of people, this is a not a lifestyle choice but a necessity, in order to make ends meet. When you are a family on a single income with four children you do a lot of opshopping, bargain hunting or clothes making, and you don’t go crazy clothes shopping. At least that was my experience when I was growing up. I mean, I love going to op shops and having a rummage around now and again, but there is not point in buying things new or otherwise if you don’t need them in the first place. A bargain is only a bargain if you need it. Is a person who is always buying secondhand goods because he/she simply wants them (or because it’s trendy) more noble than someone who prefers to buy new items as they are truly needed? I was going pretty well, then crashed and burned yesterday with a visit to Kmart to get some thongs for the little BGs. And I did buy a couple of books on Book Depository and Readings… In my defence, your Honour, the books were mostly Christmas and birthday presents- well, mostly :).